Drive – A mysterious Hollywood stuntman, mechanic and getaway driver lands himself in trouble when he helps out his neighbour. A movie that neither of us had seen and was suggested by Roger who supplied us the beer. We both ended up liking it, but one of us a little more then the other, enough to search out some of the soundtrack songs. The movie is beautiful to look at, full of awkward silences, and at times flat out gruesome. 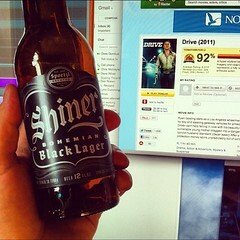 One thing we did agree on was that there wasn’t enough chase scenes for a movie named Drive. The best scene of the whole movie is the chase scene from 54:00 to 55:50.